The culprit for our excessive banana consumption can easily be attributed to our smoothies. On average we have one every second day for our breakfast. I wouldn’t say I have this one for breakfast, but it doesn’t mean you couldn’t. 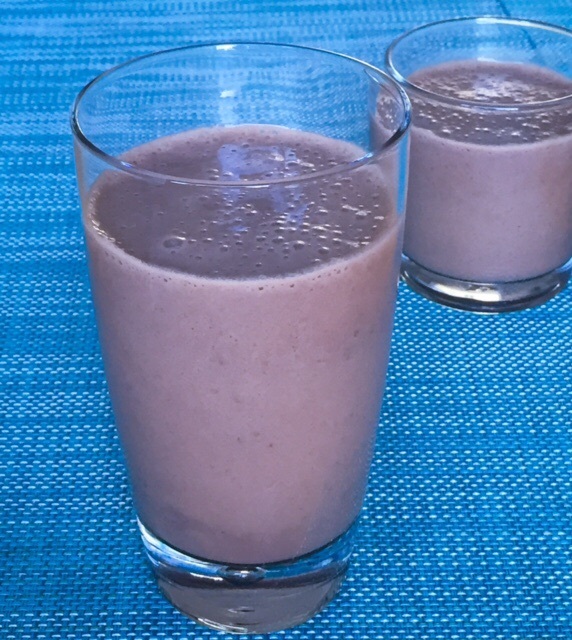 This just happens to be the very first smoothie I ever made – many years ago. It was probably my first one ever tried when I was living in Vancouver. It was easily the best transition drink into smoothies for me and I still enjoy it on a nice summer day. It is very easy to make, doesn’t use a lot of ingredients and I have yet to meet a kid who did not enjoy it! I have used soya milk in this recipe. I realise there is a lot of controversy about using it, so I usually ask before serving it to someone. We are fortunate that we can easily buy non-GM soya milk which is why I keep using it. (I personally prefer it for some things. We also have a large repertoire of Almond, Coconut and Hazelnut too!) You could easily swap this for almond milk if you prefer – I find the creamier soya seems to be an easier sell to kids. I also mix this up by using strawberry soya or vanilla soya just for a change. Place all the ingredients into your blender and blend until the ice chunks have broken down to form a thick milkshake like consistency. Serve immediately. If it is too runny, just add more ice and re-blend. And if it is too thick just stir in a little more chocolate soya milk.